Preheat oven to 350F. Butter a 9 by 13-inch pan. Sprinkle cinnamon sugar and move pan around to make sure that the bottom and sides are coated. Set aside. In a medium bowl, sift together the flour, baking powder, baking soda, salt, nutmeg, and cream of tarter. Using an stand mixer, cream together the butter and sugars. Beat for three minutes. Scrape down the bowl. Add the Mascarpone cheese and beat until fully incorporated. Add eggs, one at a time, scraping down the bowl after each addition. Add the vanilla and beat for another 30 seconds. On low speed add the sifted flour mixture. Mix until fully incorporated. Add optional cinnamon chips if desired. Spread mixture evenly into prepared pan. Sprinkle more cinnamon sugar on top of the batter. Bake for 20-25 minutes. Remove from oven and let cool on a wire rack for 5 minutes. Cut into squares and serve. Your blondies look and sound amazing. I'll have to make them someday. I only had one thought when I saw these on my google reader: WANT! These look fabulous! Yum. 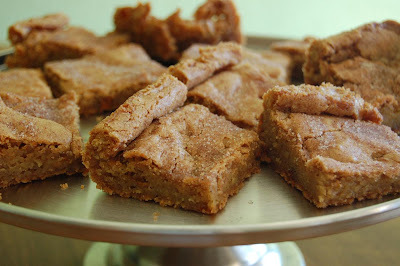 I need to try these Peabody blondies! Love these! 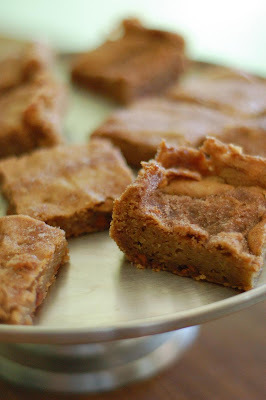 Way better than regular brownies! These look so delicious! I can't wait to make them! These look delicious, Anne! And I have another husband in mind who will really love these :-) I need find someone willing to smuggle some cinnamon chips into 'Bama - I can't find them anywhere! Can't wait to try these! I've been wanting to make these for so long! I have wanted to make these for so long. Yours look great.